Revised 4/11/2014 We have expectations or we know what is typical. We set goals to close the gap. Sometimes we know that we are closing the gap, but how long will it be before the gap is actually closed? This tool was developed to help you to determine how many additional weeks it will take to close the gap. Enter data for the typical or expected scores in the first and last week you plan to test the target student. Enter the number of weeks in one year, then enter the baseline and goal data for the target student. The file will graph the data and provide you with a brief narrative explaining how many additional weeks it will take to close the gap, and how many more weeks it will take than what has been recorded. Repeated Reading is a research based strategy for increasing the automaticity with which a students reads connected text. This strategy is appropriate for students who have mastery of the strategies necessary to read text at a given level, but still struggle to read fluently and accurately. 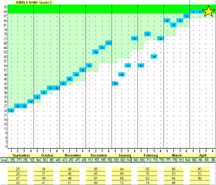 This chart is set up to monitor progress for up to 11 weeks including both "hot" and "cold" reads. REVISED 3/2008 The Diagnostic Test of Word Attack Skills is a test / tool for use in assessment, and prioritization of teaching word attack skills. Use this excel template to determine the existence of a problem (i.e., obtained score is different from typical scores for peers) and to determine the correct level of instruction for a student (when compared to peer norms). This template is a tool to graph data, without peer comparison it is not useful for much. 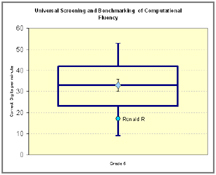 This excel worksheet will take data input from universal screening and benchmarking and make a single box plot. (additional features include the ability to plot an individual student over the box, as well as class averages). 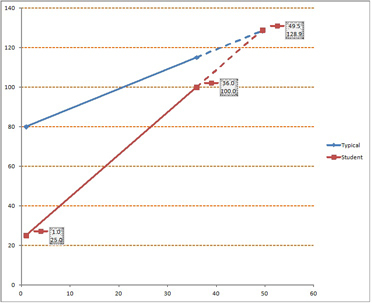 This file provides a rough graph of progress monitoring data. It is in the style of those progress monitoring graphs found on DIBELS Progress Monitoring booklets. Enter the data for each week and data will auto plot on the PM chart.